His collection contain over 1200 skull watches,skull goblets,skull victorican jewelry etc. The skull is decorated with genuine Citrine precious stones in the eyes. The skull represented the contemplation of eternity. Form probably intended as a pill box. Made from. 925 silver. The'Box' has the following features:OVAL. ===============================================. This is a nice and usable solid sterling silver pill box dating from the early years of the 20th century - the piece carries full U.K. hallmarks for Birmingham 1911 and has the silversmiths mark for Joseph Gloster. Gorgeous continental silver trinket box stamped 800, repoussé design with pastoral lovers scene on the lid. The sides are adorned with roses, fruit and leaves, it stand on three small feet & is lined with darkest purple velvet. Beautiful little cloisonne enamel pill box with hinged lid. Round shape with a petit point rosedesign, embroidered on lid. Body made of brass. Excellent condition. 2.5cm high. 3.5cm wide. Highly collectable Offers Welcome. The inside of the pill box is hallmarked, '925'. The pill box weighs 20 grams. I have for sale a wonderful sterling silver good quality rounded rectangle shaped pill box. An ideal gift for any Antique lover! Lid and hinge in excellent working order. Stamped 925 on inside edge. It is hallmarked on the interior lip of the lid with the French wild boars head for 800/1000 solid silver fineness and a makers lozenge. The interior is silver gilt and there is a fitted mirror in the lid. This box is made of gold-plated silver (marked). It is tested. You will receive exactly what you see in the photos! It is in good honest antique condition with a chip to the coachman's hat and cracks as per the photos and the internal mirror is fine as is the hinge and there are no repairs or restorations. Rectangular in shape ~ withhinged lid ~ and standing onfour feet. Tiffany solid Sterling Silver round trinket pill box. DESIGN: 7928E Makers 2544 Tiffany. MAKER: Tiffany & Co. HALLMARK: 925 - 1000 sterling silver. This superb used antique is in good condition. IT S IN VERY GOOD CONDITION,WITHOUT DEFORMATION OR CRACK,WE MUST JUST TO NOTE,FEW VERY SLIGHT TRACES OF USE. HALLMARK "WEEVIL",800/1000 AND SILVERSMITH HALLMARK. Features a very ornate hand painted scene on front. Scroll engraved silver. Opens and closes properly. Unless otherwise stated, all of my jewelry is estate jewelry, previously owned. Marked: 800. It is marked 925 on the bottom. And indeed, the painting depicts Aurora's Chariot and appears to be based on a 1641 fresco by Guido Reni in a Roman Palazzo. The cherub above bears a flaming torch and represents the morning star. (Or maybe it is to simulate a faux finish simulating marble or turquoise, since that was commonly done on palace walls as well.). IT S IN VERY GOOD CONDITION,WITHOUT DEFORMATION OR CRACK,WE MUST JUST TO NOTE,SLIGHT MARKS OF USE. HALLMARK WEEVIL,835/1000 AND SILVERSMITH HALLMARK. Great looking deco step design on the top. A beautiful solid sterling silver pill or trinket box, marked London, 1918. Lid is made of faux tortoiseshell with ornate silver inlay. The box is in very good age appropriate condition with a tight fitting lid. Really Lovely, Good Quality, Vintage, Hard stone topped, marble ? Gold coloured metal pill box, working snap shut lid, It measures 4.5cm in width, No makers marks, Please see pictures. Rest assured this item will be VERY well packaged for dispatch, Please look at my Ebay store, Personal collection welcome on all my items listed, Thank You, Payments I accept Paypal, Postal Orders, and cheques, International buyers Paypal only Please. An elegant silver plated vanity pot for the lady's or gentleman's dressing table - ideal for storing earrings, cuff links, rings, coins etc. Probably once contained cream in the late Victorian or Edwardian era. The inside of the pill box is hallmarked, '925'. The pill box weighs 20 grams. I have for sale a wonderful sterling silver good quality rounded rectangle shaped pill box. A good quality item. Raised hinged lid. Maker : Bilston. Crackles to the base and inside. Age : Late 18C/ early 19C. Get images that. make Supersized seem small. This has all been sympathetically done. The mount has been re-attached to the base. The item carries full French silver hallmarks which consist of the Minerva head mark and the silversmiths mark within a lozenge. Silver Pill Box - c.1880 - 1900. 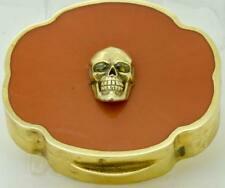 This is a nice pill box for a collector or could be used for its original purpose if desired. Condition: Very Good, cracks in bottom agate.